LDA Srijan Affordable Housing Scheme 2016: Along the registration of Anubhuti Affordable Housing Scheme 2016, Lucknow Development Authority invites applications for the allotment of flats in LDA Srijan Affordable under Priyadarshini Yojna at Sector-B, Lucknow. Srijan Apartment is a new flat scheme of LDA under Priyadarshini Yojna located at Sector-B. In Srijan Apartment, total 144 flats are available for registration which are constructed in G+10 and G+9 type building. 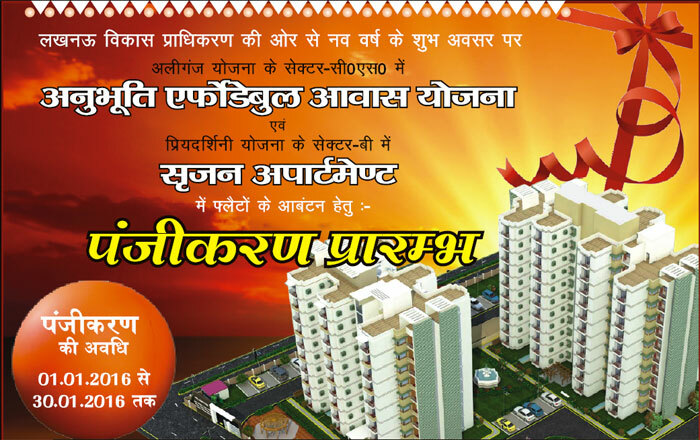 Flats under the scheme are located in Sector-B-Priyadarshini Sitapur Yojna. Applications for the same are being offered through offline mode of registration from 1 January to 30 January 2016. In G+10 type building, the estimated super area of flat is about 86.8 square meter which cost around Rs. 40.75 lakh while the estimated super area of flat in G+9 type building is about 87.32 square meter which is available at the estimated cost of Rs. 41.00 lakh and the registration amount for a single units is 5% of estimated cost of flat. How to apply: Applications for the scheme are being offered through offline mode of registration. For registration, application form can be collected from the authorized bank branches of following bank mentioned below by paying Rs. 525/-. UCO Bank: Lucknow Development Authority, Vistar Patal Gomti Nagar Lucknow, Lalbagh Branch (Authority Complex) Lucknow. Indian Overseas Bank: Vivek Khand, Gomti Nagar Ashiyana, Kanpur Road Yojana, Lucknow. Canara Bank: Vipin Khand, Gomti Nagar, Lucknow. Oriental Bank of Commerce: Munshipuliya, Indira Nagar, Lucknow. Applications form can also be downloaded from the official website of Lucknow Development Authority. In case of downloading, the cost of applications to be submitted with the registration amount at the time of application submission. The complete details of the scheme can be obtained by visiting the official website of LDA Lucknow.